HITC gaming's selection of popular fantasy boardgame favourites taking you on a fantasy gaming journey from Discworld to Westeros to Arkham! There definitely feels to have been a resurgence in the popularity of boardgames over the last few years, there certainly are more and more of them around. With a lot of console games focusing on bringing the multiplayer online, in some ways boardgames fill the local multiplayer void for those times when you have people over and not everyone wants to play Rock Band or ‘wait for a go on the controller’. It’s well documented too that board games encourage social skills and interaction and for that reason some of the games we’ve selected are of the more accessible variety so if you’re into your fantasy games and have kids or mates put off by the mere thought of learning a set of rules contained in an encyclopedia there are some choices for you to try. It’s true sometimes with Fantasy boardgames getting all the paraphernalia ready to play and then putting it away again can be a choresome task but fear not! We’re sharing our top five favourite Fantasy boardgames that are well made and enjoyable enough to warrant all the prep and (in some cases) the longs hours to finish the game. We’ve included Terry Pratchett’s Discworld inspired board game as not only does it convey well the character and humour of his celebrated novels but it’s a good easily accessible game to pick up and learn quickly that won’t take you all night to play. The game doesn’t suffer from lack of depth however, there is a lot of strategy and double guessing your opponents and the secret player objectives determined by your character add an air of tension to the game. Set in the corrupt Ankh-Morpork city state melting pot at the centre of the Discworld you’re on a mission to gain control over the city by deploying minions and building property. There’s a well worked mechanic using ‘trouble markers’ that can block others building property and all player actions are determined by cards in the player's hands. A 12 sided die comes into play only to determine where in he city random events occur although said events can take a while to surface in the game, which with its fast moving pace can get missed out if you plough through a game too quickly. 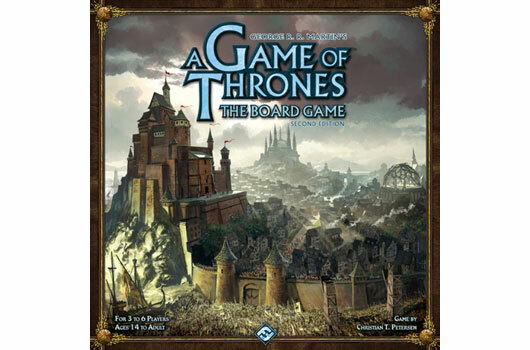 The boardgame adaptation of George R R Martin’s hugely successful A Song of Ice and Fire is rather less accessible than his books but it does a fairly good job of emulating the posturing for power over Westeros. No dice rolls at all in this game, everything is determined by a set of order counters that you place face down and then reveal during a action phase and a set of recognisable characters from your chosen house, Baratheon, Lannister etc that add bonuses and abilities. A territorial battle over the Westeros map the game is restricted to 10 turns, which doesn’t seem much but a game can go on for a while especially if you’re new to the rules. We love the back-stabbing against forming temporary alliances to gain mutual benefit in this game. Playing as house Stark can be a little bit of a disadvantage being stuck up north (something which is balanced out with the A Dance with Dragons expansion) and losing just one of the order counters renders the whole thing useless as even if you make up a replacement people are going to know what your secret orders are. Other than that once your learn the rules games can flow well and are full of Game of Thrones details to keep fans happy. Play as one of the four demonic gods from the Warhammer fantasy universe (Slaanesh Tzeentch, Nurgle or Khorne) and pollute the world with an evil dependant on your particular chaotic bent, Chaos in the old world while being similarly rules heavy to A Game of Thrones can be played through relatively fast and although die rolls are used, this game does reward players who know their strategy. With several ways to win the game you’ll need to work out the best way to do so with your particular demon-god be it evil magic, bringing plague and ruin or corrupting the local aristocracy, this game has magic, nasty demonic servants and plenty of flavour although its not a game for people that like playing the good guy. 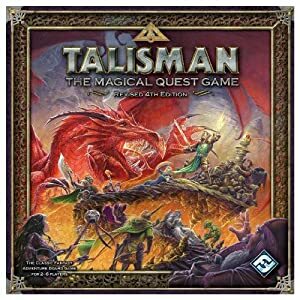 Talisman has a history going back over 30 years during which time not much has changed. This is a champion of easy to pick up Fantasy Board game fun and is one that often gets played with the kids. Essentially fantasy Monopoly almost everything is decided by random dice rolls although there is a ‘leveling your character element’ to the game which keeps you invested as you try to gain items additional stats and followers to boost your chances in battles. Win more battles and you can keep enemies you defeat as trophies when you in turn hand in for stat bonuses, making winning fights key to levelling above your opponents. To win the game (in the default Talisman rules) you need to make a high stakes stat check to break through into the middle of the board where you race to the centre. You can’t get into the centre, no matter how hard you are without a Talisman so getting one (and hanging on to it) becomes paramount. With as many expansions as a long running MMORPG Talisman with extra content can be an epic game that can just keep on going but we don’t mind so much about this as the wealth of questing, magical encounters, spells, extra bits of board and broad selection of simplistic but well realised characters are quick to get into and we love the dice determined aspect of the game that can level even the most luckiest of players to ruin, toadification or even death. Hands down the best Fantasy Board Game we’ve played in a long time and one that every time we play it has us wanting more games console games based on HP Lovecraft’s Mythos. Arkham Horror is a game that doesn’t want anyone to win. Playing co-operatively you move around the city of Arkham as a thrown-together group of characters seated more in reality than fantasy. You play as bootleggers, labourers. violinists, psychiatrists etc, as real people with real professions. Despite your best abilities to level up your character (again with followers items spells etc) you’re constantly reminded of your futile humanity in the shadow of a dormant Eldritch god that you need to keep from awakening by closing down demonic portals opening across the city. 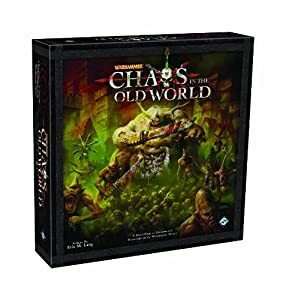 Fail to close portals and you’ll soon be swamped with monsters whose population you also need to keep down to stop locations on the board closing down and followers leaving town in terror. Never have we played a game with such a palpable, foreboding sense of tension to the proceedings. Not only to you have to be organised and on your game but you have to be extremely lucky, not just with rolling dice (which sometimes means you rolling a hefty handful of dice, we love games where you get to roll loads of dice in one roll) but with cards that you pick each turn to determine in-game events. We’ve played games of Arkham where it’s been all over within a few turns and very rarely have we closed enough portals in time to stop the Ancient One awakening. Even if you’ve got the best set of items and skills etc for you character you stand very little chance of beating down the Eldritch god if they do awaken! Despite being a fairly rulesy game and one that has an overkill amount of different card decks (often very similar in colour just to confuse things further) we highly recommend Arkham Horror for the co-operative gameplay and the extreme challenge, yes it’s heavily stacked against you to win but on the rare occasion that you do, you and your mates feel a massive sense of achievement. Brilliant game! That’s our top 5 fantasy board games from the ones we’ve played (and there are many) If you're new to Fantasy Board games we think the games above are well worth a play particularly Talisman and Discworld: Ankh-Morpork if you're put off by complicated rules. Veteran Fantasy board gamers what do you make of our op 5?